Beautiful Cameo Pendant necklace. 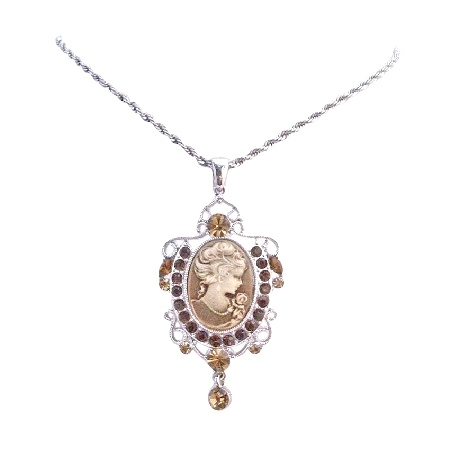 This is such a Beautiful Lady the vermil Smoked Topaz Dangling Pendant. The Pendant Embedded with Smoked Topaz & Topaz Crystal. The pendant is adorned by sparkling Crystal Excellent quality. Perfect with any outfit Superr Grade RARE HIGHEST QUALITY. Good shinning surface quality with unique attractiveness & fashionable flair to this stylish. What is in this season? Check this out! Necklace a trendy piece with beautiful Cameo Lady Pendant Necklace a perfect piece for anyone to wear for a formal or casual occasion!.